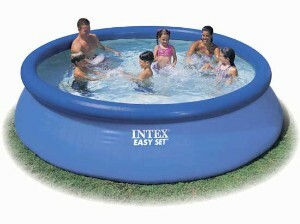 Easy set pools are commonly referred to as doughnut pools, inflatable or soft sided pools. These above ground pools have an inflatable ring around the top that sort of holds things together. These inexpensive pools can be a good entry level pool for a family on a budget. They seldom come with an adequate filter, ladder or cleaning equipment but all these things can be upgraded as money allows. 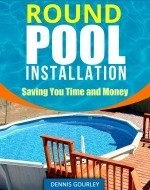 Easy set pools claim to be very easy to install. Having done several I tend to disagree with that. The ground needs to be as level, if not more so, than a steel wall pool. If there is a slight slope the pool tends to shift and become very lopsided. When this happens it's best to drain the pool and start over. The first inflatable pool I installed came as a surprise. I thought I was going to install a regular above ground pool and when I got to the customers house I found she had an easy set instead. I did not have an air compressor with me so I borrowed her hair dryer. It did the job but quit working just as the pool was finished. An adequate air supply is a good thing to have when doing this type of installation. Getting the wrinkles out of the bottom can also be a little tricky. Pull the bottom as smooth as possible before turning the hose on and then hop in. About twenty minutes on your hands and knees will usually have the bottom pretty much wrinkle free. This is an easy set pool and what is not shown in the photo are the inadequate filter system and ladder. Upgraded systems are easy to adapt, and will make owning your first pool a better experience. More information about these pools is available on the soft sided pools page and the metal frame pools page. These are, for the most part, a decent way to get a pool in your back yard without breaking the bank account. 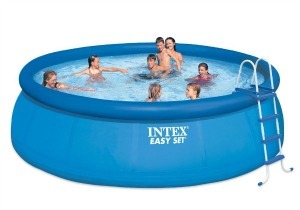 Intex makes Easy Set Pools and Metal Frame Pools. They are carried by In The Swim at ready to purchase prices.